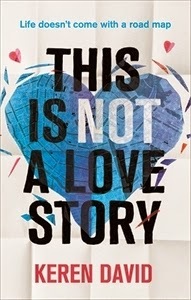 This Is Not A Love Story by Keren David was a really amazing read. I knew it would be. I've previously read and loved every book by Keren David and she has quickly become a favourite author. Briefly, This Is Not A Love Story, is about three main characters. Kitty and Theo are both Londoners who have recently moved to Amsterdam and meet each other at school and meet each other and also, Ethan, this rather moody boy. This is a story about finding that place to belong about friendship and family and about falling in love. Instead of doing a more traditional review for this book, I thought instead I might give you this list. As I said, I'm a huge fan of Keren David's stories. I've read every book she's published and I've loved each of them for very different reasons. The thing that ties all of the stories together is Keren's unique writing style that pulls strands of everything together to form this wonderful story. This is a great story about friendship and family and religion and sexuality with a great setting but woven together with all of these different things is emotion and honesty and there's just something about the way the author tells this story that makes me believe every word and makes me feel strongly about the characters and their relationships to each other. I absolutely adored the mention of the Jewish religion in this book. I don't come across many references to Jewish people or Jewish customs and holidays in a lot of the YA that I read so it was absolutely refreshing to have religion play a significant part of the story, especially one that I know very little about. I specifically loved focus on the experiences of North London Jewish people and how this community is so significant. I loved how each of the characters has her/his own take on the Jewish religion: Kitty wants to escape the fishbowl effect of being part of this community, Theo embraces it and Ethan feels on the outside of it all. While I think there is a great deal of falling in love in this story, it's worth bearing in mind that as the title suggests, this is not a love story! The way in which sexuality is explored is included as one of my reasons for loving this book so much is because I really did enjoy the twist given to the love triangle trope. I also just loved the way in which new relationships are described just in general. Kitty in particular is very open to speculating on how she should be feeling as she begins a new relationship with Theo and exploring her own thoughts and feelings about previous expectations compared to how she is feeling. And the same goes for Theo as he questions his own changing ideas of his sexuality and how he feels about Ethan. I feel like sometimes authors have this fear of including popular culture into their stories. There is, I'm assuming, the fear that inclusion of such things in stories will date a novel far quicker than omitting such things entirely. Personally, I find that including such things as YouTube and Instagram, the way in which Keren David did in This Is Not A Love Story, causes me, as a social media addict, to enjoy the story on another level. And at the same time as being very on point with the times, I loved the way in which Kitty begins to examine her social media presence and the way in which she feels it necessary to always put her best face forward and always portray herself and her life in the best possible way. I think this goes back to expectations that I brought up previously and I think it's a very clever way of exploring the idea of identity and how things like social media have an impact on one's idea of self. Most of all, more than any other reason in this list, one of the biggest reasons I love and recommend This Is Not A Love Story is that it feels so much like a love letter to Amsterdam. I've been to Amsterdam, and recently, and after reading the descriptions of Amsterdam in this book I felt like I could close my eyes and be transported right back to Amsterdam. Keren David really brought the atmosphere of Amsterdam to life in this story. And it is very clear from the way she writes about the place that Amsterdam must hold a special place for Keren David. It really shines through and makes me want to immediately book a ticket to return! Lovely presentation for this book, I'm very tempted right now! This is a lovely list and it's made me want to read it even more now! I'm really interested in the sexuality side, I haven't read much about bisexuality in YA. Excellent review, Michelle! I can't wait to read this. Keren David is absolutely one of my favourite YA authors... her books are always so interesting and different.